Here is the December 22, 2000, letter signed “God Bless. I prefer to remain anonymous” mailed to the Sarasota Sheriff’s Department. Newspapers in Florida, the Art Bell show, and other radio programs during mid-February, decided to talk about the Myakka photographs. The hope is that the woman photographer will be identified. In the meantime, meaningful analyses of the eyeshine, the pupil diameter, the dentition, the tongue, hair color, and exhibited behavior of this apparent primate is taking place. At right: A young male Sumatran Orangutan, Pongo pygmaeus abelii, American Museum of Natural History. Below: Concurrent with my thinking, Tony Scheuhamme, a biologist with the Canadian Wildlife Service, pointed out some features on a good photograph of an orangutan by Denise McQuillen. 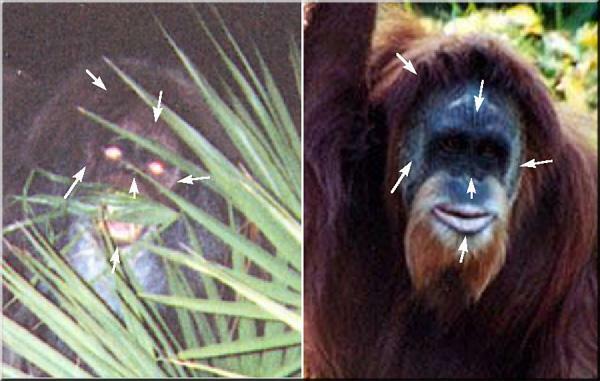 This is not to say the Myakka photographs are of an orangutan, but it certainly assists in identifying features that are found on a known anthropoid that appear to exist on this one too. 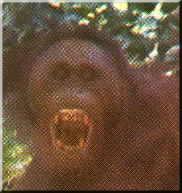 The Myakka ape head closeup Copyright 2001 by David Barkasy and Loren Coleman. Compared with a Sumatran Orangutan’s head, photograph at the Cincinnati Zoo by Denise McQuillen, 1999; Reprinted with permission. 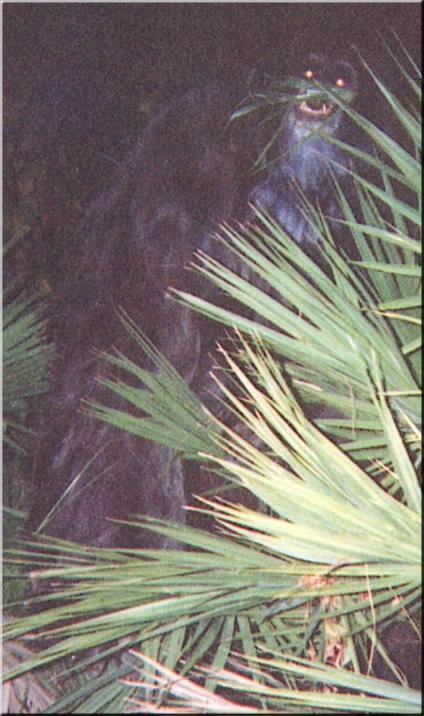 Could this be a “Skunk Ape.” an as yet-undiscovered large anthropoid, per the “Unknown Pongid” type discussed in The Field Guide to Bigfoot, Yeti, and Other Mystery Primates Worldwide (NY: Avon, 1999)? 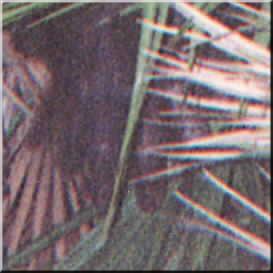 The Myakka Ape Photographs are only the most recent of a long history of Skunk Ape and related mystery anthropoid reports. I have files, and letters from people that lived along the east-central coast of Florida (mostly in the Holopaw-Brooksville area) who related to me their series of encounters with apelike animals, especially during the 1963-1968 period. We should not be surprised that the Everglades may not be the key to solving this mystery, but the Myakka area may. We are following leads to attempt to discover the photographer. 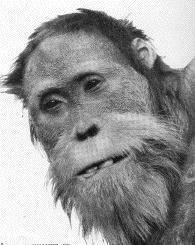 (Photo credit: John Mackinnon’s In Search of the Red Ape (NY: Holt, Rinehart and Winston, 1974). 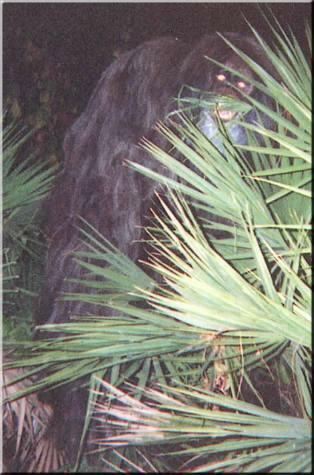 It’s been nearly nine months and there’s been no reappearance of the Myakka Skunk Ape. At least no official reports. This past February newspapers throughout the Southeast caused a supernatural frenzy when they ran stories about the appearance of a smelly ape nearly seven feet tall in a backyard east of I-75 in Sarasota. 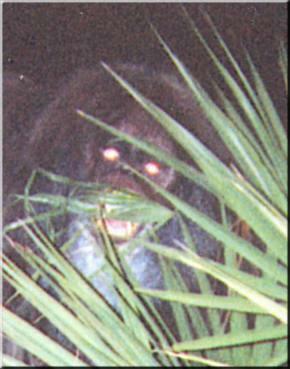 Some writers quickly dismissed the idea of Florida’s answer to Bigfoot. Others used the opportunity to tell a few jokes, and some suggested, mockingly, organizing a search (i.e. hunting) party to find the animal that resembles an orangutan. One local man has done just that. David Barkasy is on the prowl. Barkasy was one of the first people to see the photographs of the ape last fall after they were mailed anonymously to the Sarasota County Sheriff’s Office. Since then, his curiosity has been in overdrive. Barkasy, owner of reptile wholesaler Silver City Serpentarium in Sarasota, has made more than 30 nighttime trips to the forest east of the interstate hoping to find this legendary creature that was first reported in Lakeland in 1947. Barkasy and friends strung apples (a favored food of the ape according to some reports) with fishing line between trees and sat in the dark waiting for something to happen. Some nights nothing. A few nights they were chased out of the woods by something in the bushes. “We would sit back and make bird calls, and a few times you’d smell something like dead animals and then we heard palmettos breaking. It could’ve been a bear or coyote, but who knows?” Barkasy, a former mechanical engineer, says. On his last expedition Barkasy was told to leave the forest by a state ranger. It turns out the land he was on is owned by Southwest Florida Water Management District and managed by the Myakka State Park. For the men to be there after hours, they need special permission from Swiftmud, which Barkasy hasn’t obtained yet, but says he intends to do in order to install motion cameras in the area. Loren Coleman, a noted cryptozoologist (hunter of hidden animals) who has studied the Myakka case, fully believes what was photographed is not a costume or a fake, or even an escaped zoo animal. He’s bent on finding the photographer, so he can figure out where the citing took place and examine it. Barkasy is helping. He’s discovered that the photographs taken last fall were printed in December 2000 at the Eckerd photo lab at the intersection of Fruitville and Tuttle Roads. He wants to find the elderly woman who took the pictures, but who prefers to remain unknown because she doesn’t “want any fuss or people with guns traipsing around” her house. It seems the legend of the foul-smelling primate will have to remain hidden a while longer, if not forever, without the help of people who’ve made contact with it. Barkasy believes the number of people who’ve seen this creature is actually greater than one would think. State officials trying to identify big cat. State Fish and Wildlife officers are trying to figure out what kind of big cat attacked a horse in Myakka City on Thursday. Officers took a plaster cast of a cat’s paw print, left behind in the mud, Fish and Wildlife Officer Jeff Babauta said. The print will be analyzed by a Fish and Wildlife expert. A panther in this area would be a rare find. Babauta has never seen one in his in the area. A resident spotted the cat, but couldn’t say what it was, officials said. The print will be analyzed by a Fish and Wildlife expert. A panther in this area would be a rare find. Babauta has never seen one in his in the area. Thanks to David Barkasy, Hawk Spearman, Rich La Monica, M.K. Davis, and David Bittner for photographic assistance, from which enhancements and analyses were done. Details and enlargements, analyses and the text are copyrighted. Please contact Loren Coleman for permission to reprint. Thank you.